I just got back from Aleppo last week and have already made this sauce twice. I had it for the first time alongside grilled chicken, but I’m convinced this sauce goes with everything. It’s that good. I’m not even kidding you. I would classify this sauce as a mayonnaise of sorts, but not really. It’s not as overwhelming as a mayonnaise. On a side note, I find mayonnaise to be overwhelming; store-bought mayonnaise at least. It’s too rich, flavorless and, to be honest, its texture is too wobbly for my liking. This sauce is different. It’s not as wobbly — velvety would a good word to describe it, but it has its secrets. 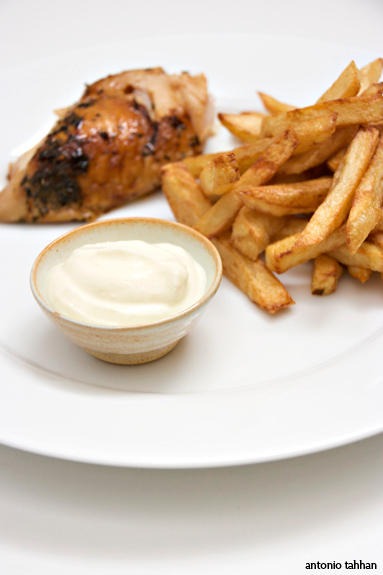 Most Arabs call this sauce toum (ثوم) or creme toum (كريم ثوم). Toum is also the word for garlic in Arabic. That’s because the sauce is loaded with garlic. Loaded. I have some Lebanese friends that will make this sauce with so much garlic that it will make a grown man cry and smile, all in one bite. My version isn’t so strong, relatively. There are different ways to prepare this sauce. 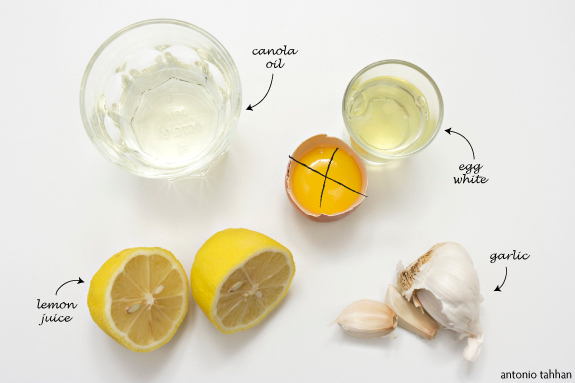 Purists will make it with just garlic, lemon juice and oil — no egg white. And it emulsifies. I know it sounds like magic, and maybe there’s a little food magic at play, but it works. Fouad from The Food Blog makes his this way. According to Fouad slow and steady is the trick — 10 minutes to be exact. 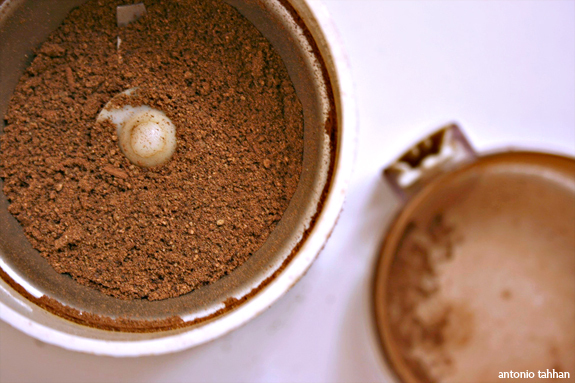 Some home cooks will prepare creme toum with an egg white. That’s how I’ve been making mine. The emulsion happens quicker and the protein in the egg white will also help keep the sauce from breaking. It also lets you get by with using less oil. In the Middle East, you’ll find that restaurants and street vendors will start the emulsion with a tiny bit of cornstarch slurry or boiled potatoes to help stabilize the sauce for a longer shelf life. Either way you decide to go, as long as the garlic is prominent, this sauce will knock you off your feet. In a small food processor (or a large one fitted with a small bowl), pulse the garlic and the egg white until you can’t see the garlic anymore. With the food processor on, slowly begin to add the oil in order to start the emulsion. 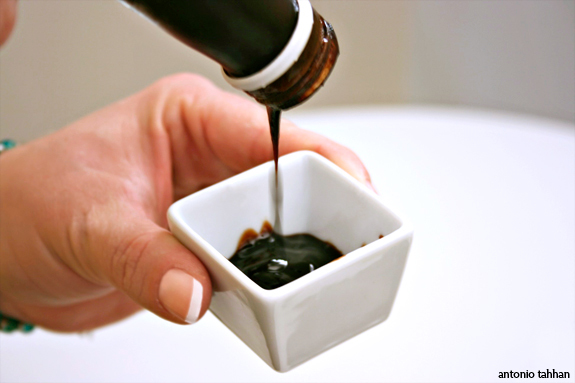 Make sure that the stream of oil going in is no more than a thin thread, or you risk the possibility of your sauce breaking. Once all the oil has been added, add the lemon juice while the food processor is still running. Season the sauce with a little salt and refrigerate until ready to use. 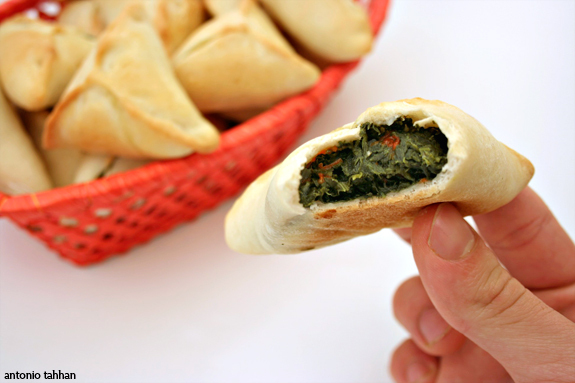 If I had to pick one dish to become a vegetarian for, it would be fatayer (فطاير). It’s a strong statement, and I’m not sure whether I would actually do it, but hypothetically, if I had to choose one dish to give up meat for, this would be the one. That’s all I’m saying. My sito is an expert at making these, and I’m not just saying that because she’s my grandmother. She’s good — not only at making these pies, but at everything she cooks, really. There’s a saying in Arabic, يسلم يدك (yeslamou eedaik), that is used to thank a cook for preparing a delicious meal — it literally translates to, bless your hands. My grandmother’s hands have been blessed plenty of times. The truth is, she’s happiest when she’s cooking, and it shows in the food she prepares. It runs in her veins, and even mine, she tells me. 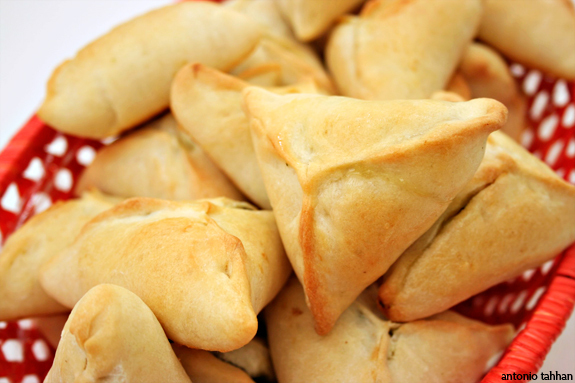 Fatayer is a simple dish, in theory: just dough and filling. The dough can be made with either milk or water. My grandmother tells me she makes hers with water, but that she’ll sometimes use milk (or powdered milk), depending on what she has on hand. Somehow she manages to make both versions taste equally amazing. I am convinced her hands are blessed! Luckily, we live in the age of twitter and blogs and facebook, so I knew this would be a perfect question to ask tweet Anissa Helou. 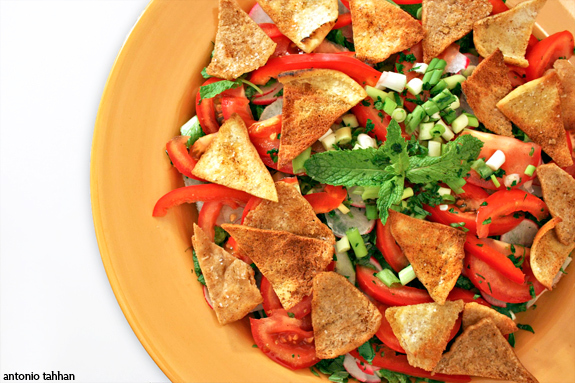 Chef Helou is a Mediterranean food scholar and instructor based in London, who also keeps a Mediterranean food blog. To her knowledge some cooks use milk in Syria, but no one does in Lebanon. My grandmother is Syrian, so this made sense to me. I have a feeling there will be some tension around the red bell pepper. While the red bell pepper is not traditional, I don’t think, it works on many levels – photogenically and culinarily. The specs of red in the filling add contrast to the shades of dark green spinach, while adding a subtle sweet undertone to the dish. It works. Try it, at least once, and let me know. The filling starts with freshly chopped spinach. I used baby spinach, but that wilts down to almost nothing. In the end, any spinach will work. 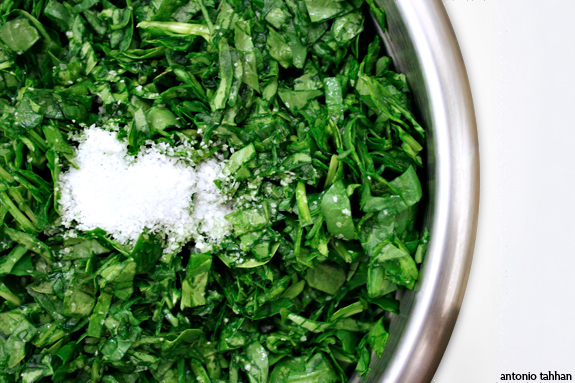 After you roughly chop the leaves, add salt to release the water from the spinach and let sit for 5-10 minutes, while you prepare the dough. 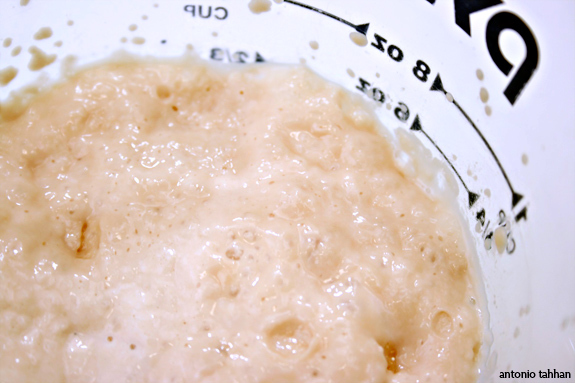 If you’re using dry, active yeast, you don’t necessarily need to make it bloom. I do this as a check to make sure that my yeast is alive and well. Simply add the yeast to warm water with a bit of sugar or honey, cover and let sit for 10-15 minutes. If it gets bubbly and foamy, it’s alive, if not, you just saved yourself a lot of frustration (and cussing). The smaller you make the dough, the prettier the fatayer will be, but the more patience you’ll need. 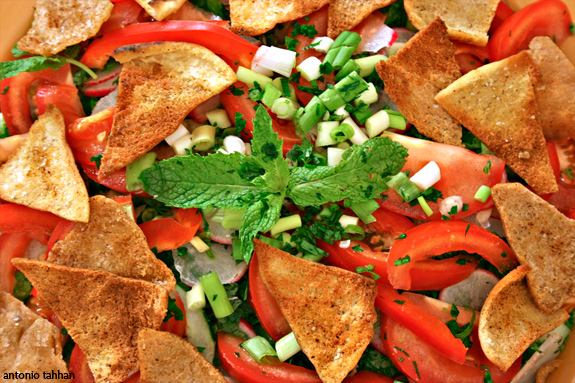 In the Middle East, these involved dishes are almost never prepared alone. The women of the family usually gather to help the host and also take that time to catch up with each other and talk about stuff I wasn’t allowed to listen to as a child. Just imagine how much quicker this would be if you had four or five pairs of hands helping you. 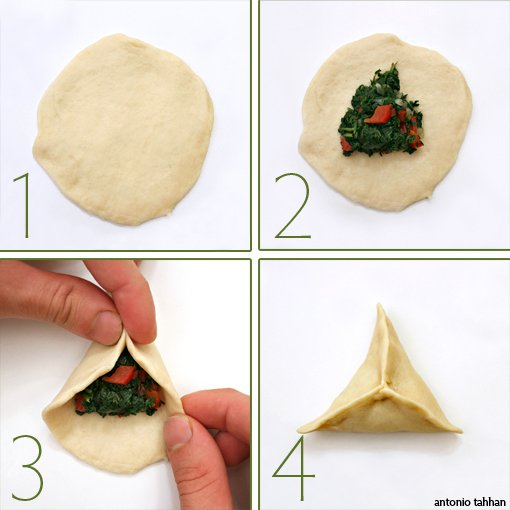 Once they’re all formed, make sure the seams are well-sealed before they go into the oven. I like to brush the surface of mine with a little milk, or a light egg wash, just to give the crust a nice sheen after they come out of the oven. These pies are surprisingly better the next day, at least in my opinion. You can heat them up for 7-10 seconds in the microwave, or eat them at room temperature, which is what I will usually do. Bloom the yeast to make sure it is alive. 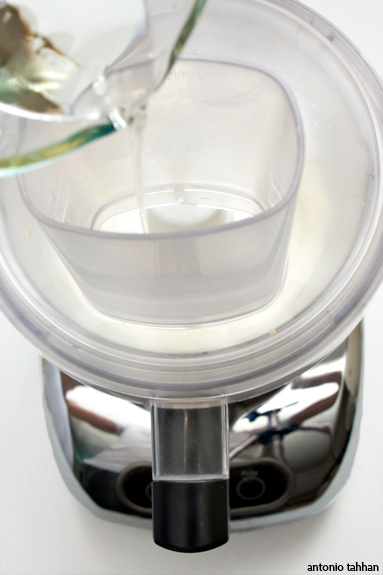 Add the yeast to the warm milk with the half teaspoon of sugar or honey. Cover and set aside for 5-10 minutes. Prepare the dough by mixing the oil with the flour and slowly mix in the yeast-milk mixture. Add salt to taste and knead for 10-15 minutes or until the dough is soft and elastic. 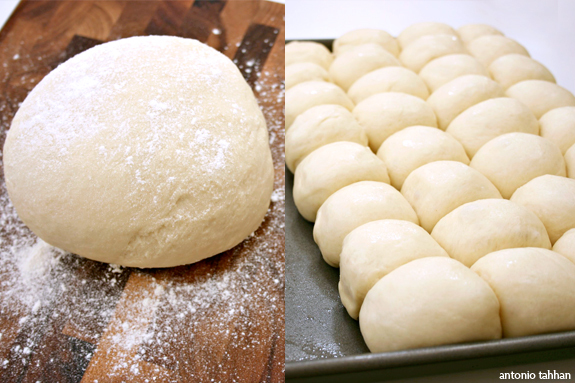 Divide the dough into individual balls (small tennis/large golf ball size) and cover with a damp towel while you prepare the filling. Add salt, pepper and sumac to the diced onions and red bell peppers to soften them. 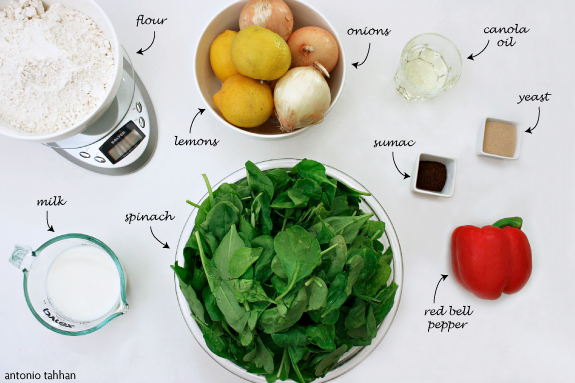 In a separate bowl add the salt to the spinach and rub the leaves with your hands until they begin to wilt. 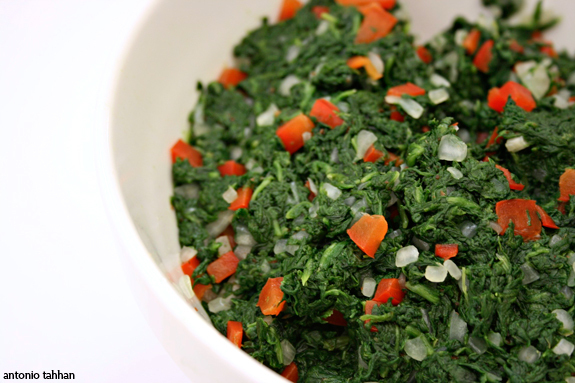 Squeeze out as much water from the spinach as you can and then mix with the seasoned onion and red bell pepper mixture. Add lemon juice and adjust seasoning to taste. 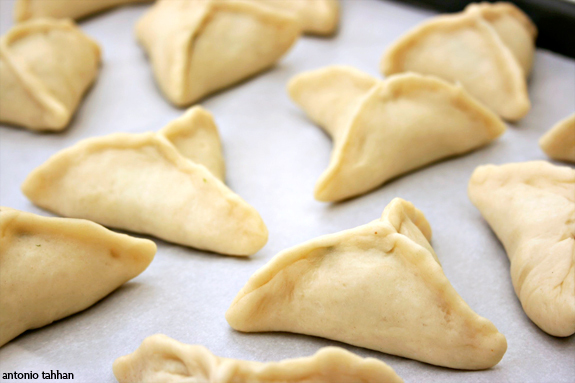 Begin forming the fatayer by flattening out each piece of dough. It helps to do this on a lightly oiled plate. If the dough begins to contract too much, that means it is not well rested yet. Add a spoonful of the spinach mixture to the center of the disc while making sure to keep the sides clear of oil or filling. This will help create a better seal later. 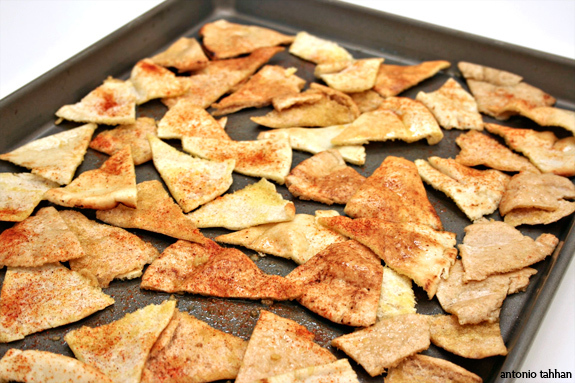 Crimp the dough into a triangular shape and set on a parchment lined baking sheet. Brush with milk or a light egg wash and bake in a 450 degree F oven for 15-20 minutes, or until golden brown. Seattle was beautiful. It was refreshing. It was sunny the entire 5 days I was visiting – a miracle, considering it rains roughly 80% of the time out there. I did get back to Annapolis about two weeks ago, but less than 24 hours after my plane landed, I was back at the airport to pick up my parents. My mom had been here before, but this was my dad’s first time at my new place. 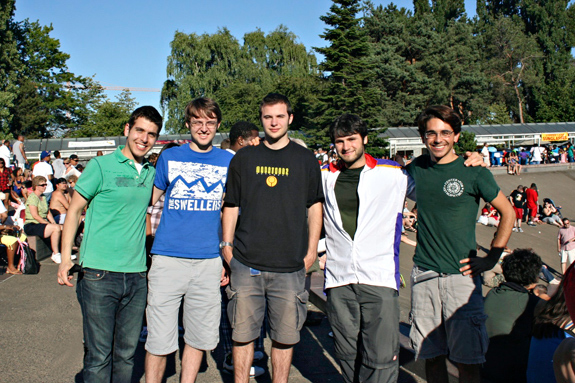 That means I put everything aside, my blog included, and showed them a good time. I was in Seattle for the 2009 Web Design World Conference. If you’re into web design and development and ever get the chance to go, I highly recommend it. The speakers were all leaders in their respective fields and gave engaging presentations; these were a few of my favorites: Jared Spool (UI mastermind), Shawn Henry (Queen of Accessibility), Dan Rubin (CSS ninja) and Cameron Moll (design guru). 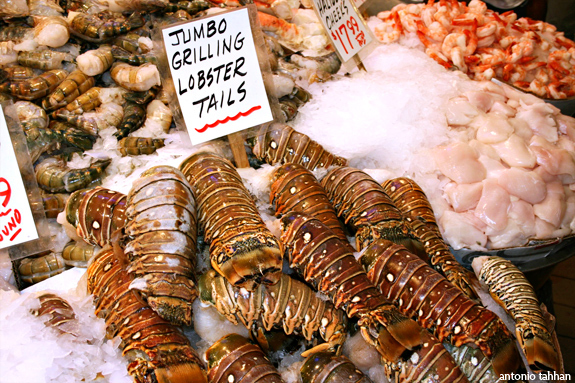 Pike Place Market was probably my favorite place to walk around in Seattle. It somehow manages to embody the small town feel of a local market, but on a large scale. The vendors, although swarming with clients, had conversations with you, jugglers and singers entertained small crowds, and best of all, the quality and selection of local produce was unbelievable – it was a fun place to be. 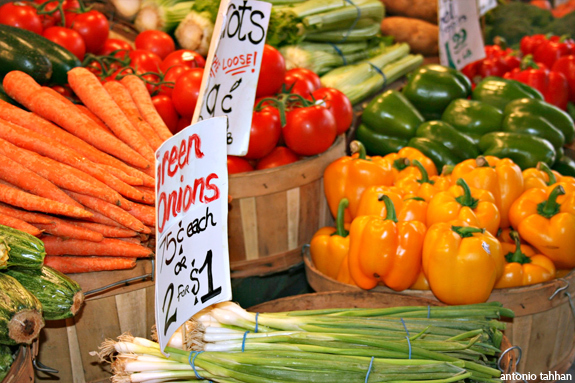 The market stands were filled with beautiful local vegetables, and the competing venders kept prices pretty low – always a plus. 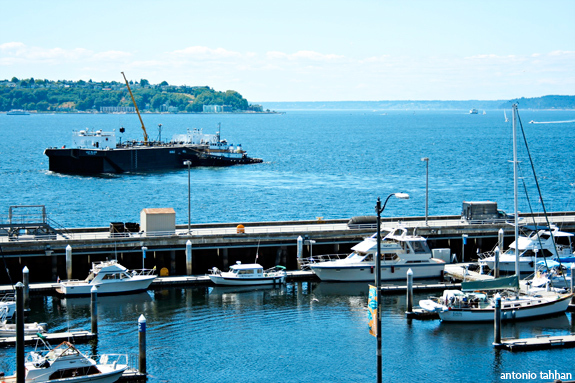 Most of the lunch venues at the Market have a gorgeous panoramic view of the bay. It was the perfect sight to stare into while I enjoyed my grilled halibut sandwich. The trip back to the east coast was ambivalent. Although I wanted to stay in Seattle forever, and visit Pike Place Market everyday, it was time to go back. I stayed staring out the airplane window for most of the flight back, thinking about what I can blog about once I get home. 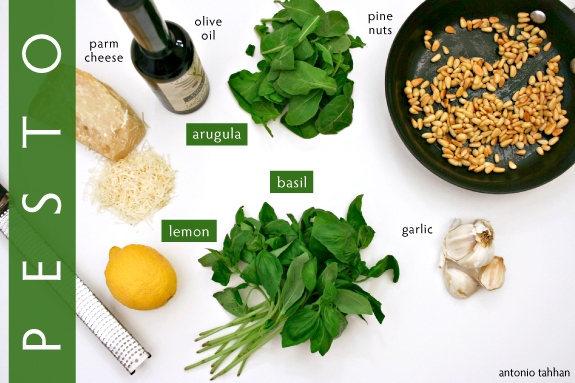 This pesto, for sure, was at the top of my list. I’ve always been a fan of the arugula-lemon combination. It’s one of those things in cooking that just works – like figs and blue cheese or chocolate and mint. Pesto, however, starts to get dark shortly after it comes together. This can be a problem if you’re dinner party starts in a couple hours or if you’re banking on some leftover sauce to give as gift or enjoy the next day. 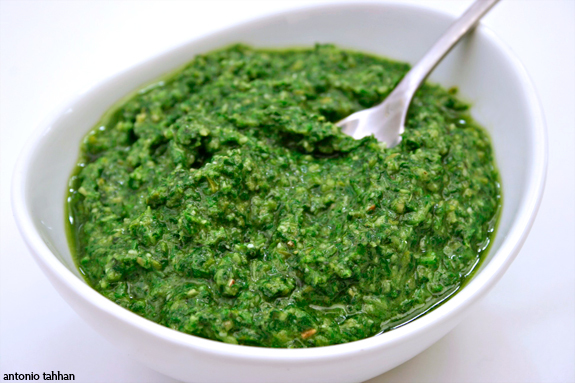 My good friend Michelle, who is quite the amazing cook, shared with me the secret to keep the vibrant green color in pesto, even days after it is made. 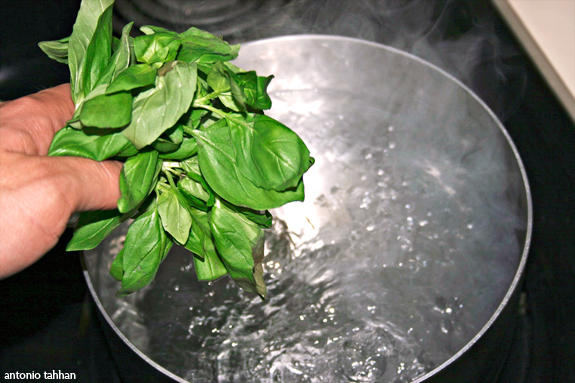 The secret to keeping the gorgeous green color on the leaves is by blanching them in boiling water for 10-15 seconds. This process actually enhances the color of the chlorophyll, but since it is done quickly, it does not break down the greens either. In order to preserve the bright green color the leaves turn, you need to immediately stop the cooking process after 10-15 seconds by plunging the greens into a bowl of ice-cold water. 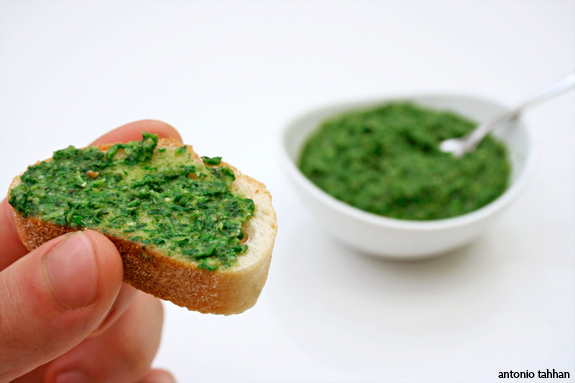 Make sure you drain and dry the greens before adding them to the pesto so as to not water down the sauce. 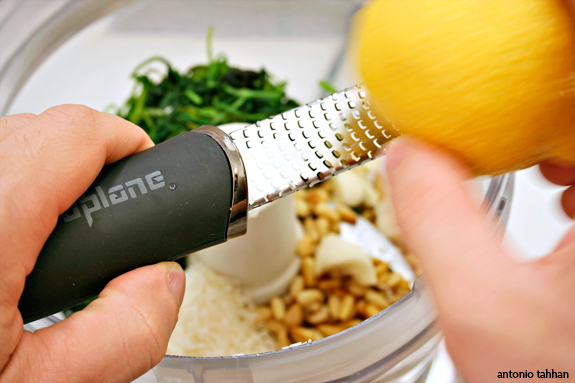 Lemon zest, similar to salt, heightens the flavors of a dish without adding too much acidity. 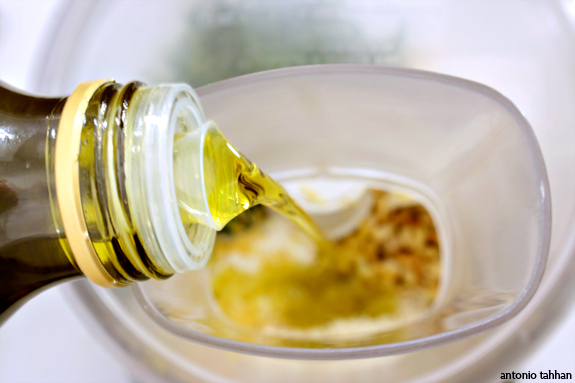 Once you have all the ingredients ready, you’ll want to bring them all together in the food processor with a little bit of extra virgin olive oil. Adding lemon juice is a matter of personal preference. 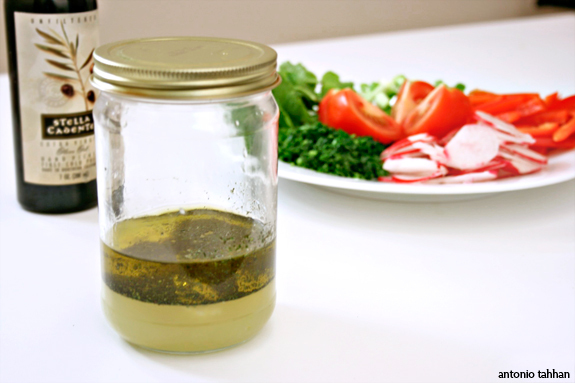 I do it because I like how that little touch of acidity cuts the fat from the oil and cheese in the pesto. You can play around with different amounts and textures, but in the end you want the lemon flavor to be a subtle note in the background and not overpower the sauce. Boil water in a large pot and prepare an ice bath in a separate bowl. Salt the boiling water. 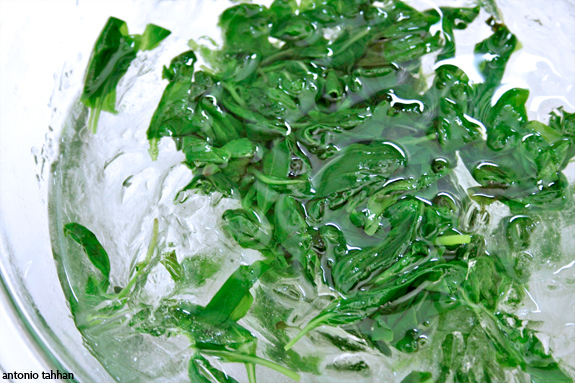 Add the basil and arugula leaves for 10-15 seconds and immediately plunge in ice bath to stop the cooking and preserve the bright green color in the leaves. Strain the leaves and pat dry using a clean towel. 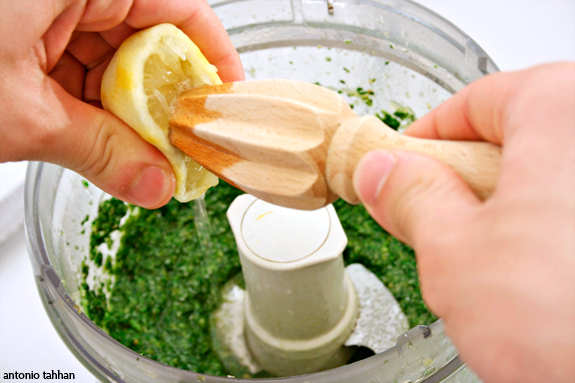 Combine all the ingredients in the food processor (or blender) and blend until well combined. Taste for seasoning. Enjoy with pasta or refrigerate with a sheet of plastic wrap on the surface to preserve the green color for up to a week. a peak of what’s coming up next! 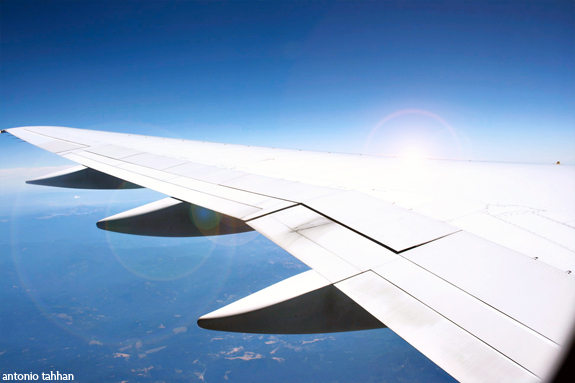 As I write this, I’m sitting in O’Hare International Airport, debating whether or not I should give up my seat on my flight to Seattle for a free round-trip domestic ticket (not valid to Hawaii or Alaska, non-transferable & non-refundable). The representative from United said I would be able to sit in first class on the next available flight, which is not scheduled to depart, however, for another 12 hours. Yes, 12 hours! Since I’ve never been to Seattle, and plan on visiting Pike Place Market as soon as I arrive, literally, I kindly declined. Although Pike Place Market is supposed to be a lot of fun, the main reason I’m going to Seattle is for the annual Web Design World conference. This is my first time going, but from what I’ve heard from friends, it’s an awesome place to go if you’re into all the web 2.0 technologies. If any food bloggers are attending the conference, or are in the area, shoot me an e-mail! Before the flight starts boarding and I get left behind, I should tell you about these stuffed eggplants. I made these with my mom when she came up to visit me last weekend. I think the most difficult concept for my mom to get used to was all the photos. “Do you really have to photograph every step,” she asked. The broth that these eggplants are cooked in, in my opinion, is what makes the dish really special. It is flavored with lemon juice, dried mint, some tomato paste and, one of my favorite ingredients, pomegranate molasses. Pomegranate molasses, or دبس رمان , is a dark, tangy, slightly acidic molasses made from fresh pomegranates, which are extremely abundant throughout the Middle East, especially Syria. You can probably find it at your local Whole Foods, specialty store, or definitely in any Mediterranean/Middle Eastern market. note: do not try and use the regular molasses for ginger snaps, for instance, it won’t taste the same. 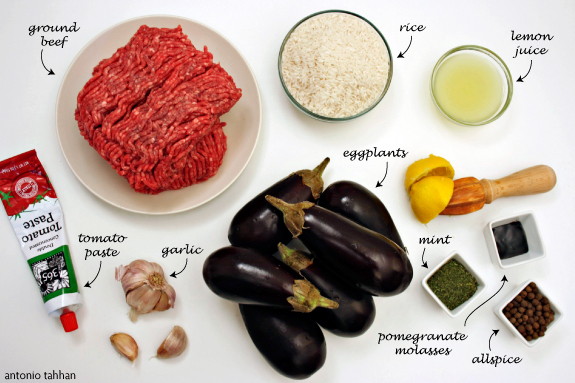 The mise en place for this dish is pretty simple, but note that the eggplants I used here are tiny. The smaller the eggplants are, the less bitter they will be, but also, proportionally speaking, the better they are for stuffing with rice and meat. If you’ve been following the past couple Middle Eastern recipes I’ve posted, you’ll notice each of them is flavored with a bit of freshly ground allspice. As I mentioned in those posts, allspice among of the most common spices used in Middle Eastern cooking, second probably to salt. Nothing in this dish, except maybe the stem of the eggplants, goes to waste. 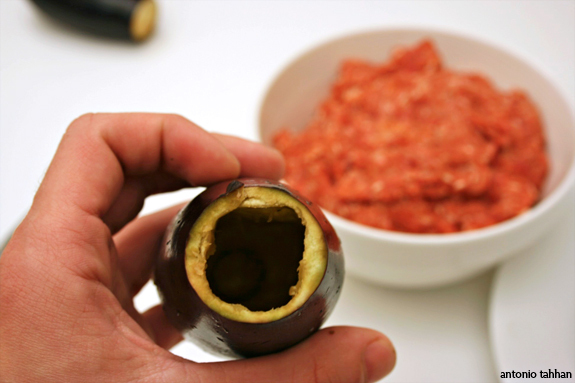 You can use an apple corer to create the cavities in the eggplants and then keep carving out any excess flesh with a small knife. Some people will leave a little more flesh than I did in the photo, but that becomes a matter of personal preference. 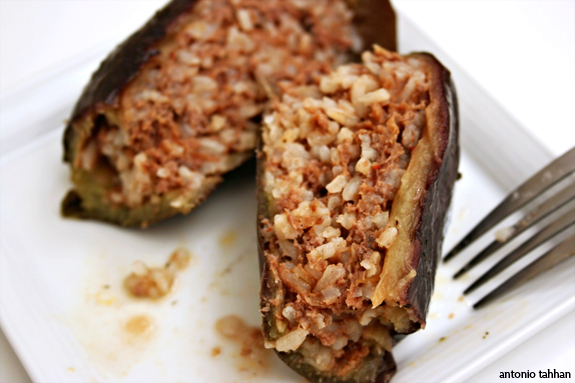 When you’re stuffing the eggplants make sure not to pack the rice and meat mixture because once the rice cooks, it will expand. I leave about 1 inch from the opening of the eggplant empty, and then squeeze the eggplant lightly so as to distribute the meat filling equally. The carrots on the bottom will provide the perfect protection to keep your hard work from turning into charcoal. They’ll also add flavor to the broth, and a beautiful color for presentation. I should clarify that the term mahshee, in Arabic, literally means “stuffed.” In this case I used eggplants, but that’s only one example. 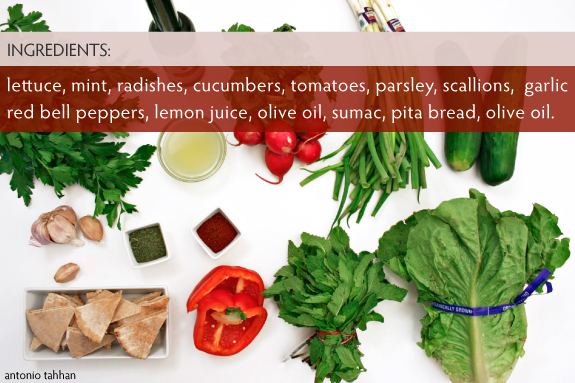 In the Middle East (and throughout other parts of the Mediterranean, like Italy, Greece and Turkey) this preparation is common with other vegetables as well, like peppers, zucchini, grape leaves, swiss chard leaves, and the list goes on from there. I actually did not beat the clock and had to board the flight before finishing the post. I am now in my hotel room in Seattle, but will make sure to post post the recipe for mahshee once I get back to DC. Wash rice in plenty of water and set aside. With an apple corer and a paring knife carefully hollow out the eggplants, making sure not to puncture any of the sides or the ends of the eggplants (save the eggplant “meat”). Stuff the eggplants with the rice and meat mixture, stopping about 1 inch from the top. 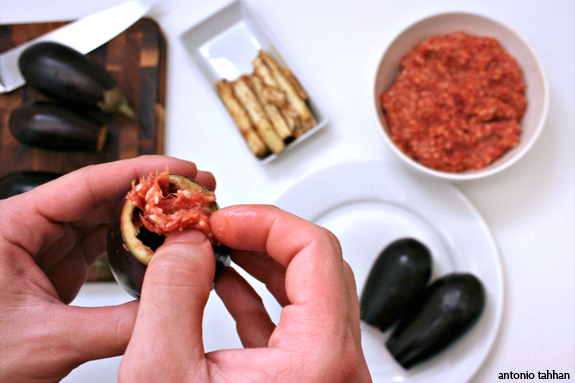 Lightly squeeze the eggplant to remove any excess meat mixture that pours out from the hole. 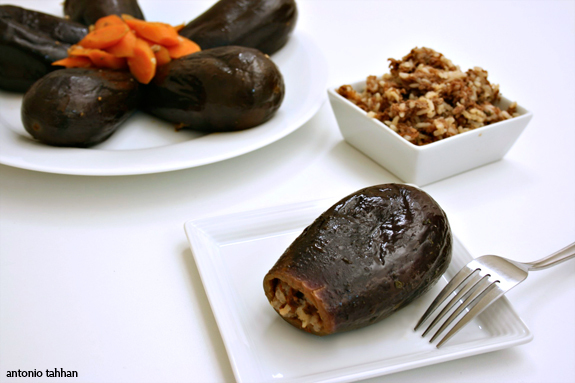 Scatter the sliced carrots and carved eggplant “meat” across the bottom of a large pot. This prevents the eggplants from sticking to the bottom and burning. Neatly position all the stuffed eggplants inside the pot. Mix the lemon juice, dried mint, pomegranate molasses, minced garlic, the two remaining tbsp of tomato paste and an extra sprinkling of salt (to taste) to make the broth. 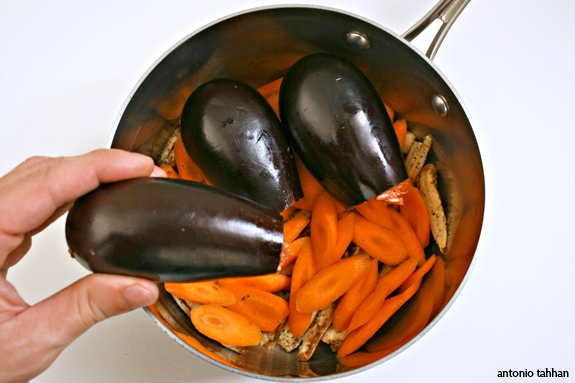 Pour over the eggplants and cover what’s left of the eggplants with water. Set a heavy (heat-resistant) plate over the eggplants to weigh them down. 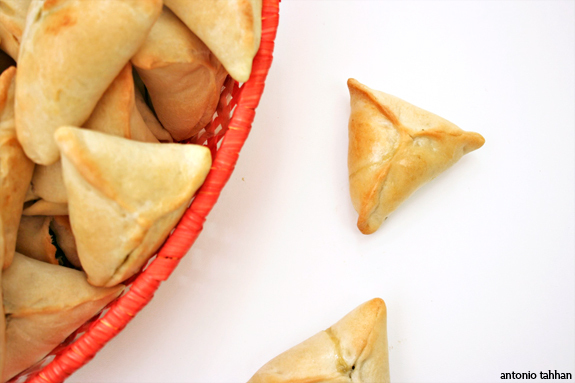 If you have any left over filling, set it on aluminum foil and crimp the edges lightly to form a small pouch. Set the pouch over the place and make sure that the pouch is at least half-way covered in the broth (if not, add more water). Place the lid over the pot leaving a little hole for steam through vent through. Cook over medium, medium-high heat for 45-60 minutes and enjoy. notes: Mix the meat and rice mixture with the tip of your fingers to avoid compacting the mixture – you want to mix, not knead.